"The Piss-Screen (the site's dead) is a pressure-sensitive inlay for urinals. 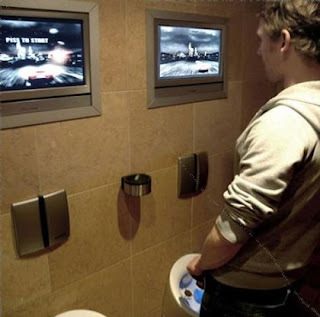 The game is displayed on a screen above the urinal. We designed a driving game in the style of Need for Speed." The game would end with a crash and display a message to the effect that the player should take a cab home. There was one other game art project with the similar input mechanics last year, only then the display was inside the urinal.